Optimized from a seven-page site, his new, three-page responsive website moves visitors through his tour options, additional perks, and extensive expertise, to boost efficiency and improve the numbers of reservation requests he receives. 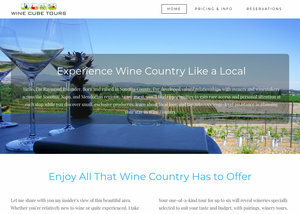 We also designed modern, dynamic page layouts, creating an image-rich, immersive experience in which visitors can practically taste the wine while soaking in the lush landscapes. Additionally, we crafted powerful messaging that conveys the premium nature of the Wine Cube Tours experience to strengthen and grow Raymond’s relationships with local boutique hotels and exclusive wineries. And finally, we created new SEO for each page of the site to significantly improve Wine Cube’s search rankings.